James T. ‘Jim’ Coffey, 82, of Toronto, OH, died peacefully Wednesday, July 11, 2018 at his home surrounded by his family. A Toronto native, Jim was born in Wellsville, OH January 22, 1936 to Ernest W. and Mary Alice (Hartford) Coffey. He was a 1954 graduate of Toronto High School and he attended Kent State University. Upon returning from Kent State, Jim was employed by Titanium Metals in Toronto for 14 years. In late 1971 he started his employment with Quaker State at the refinery in Newell, WV. He retired from Shell Lubricants (Quaker State) October 4, 2004 after 33 years of service. In 1942 the family moved from downtown Toronto to the Wallace Farm. The farm was inherited by his father from his mother’s family. His father’s dream was to develop a residential sub-division and in 1957 the dream came true when section #1 was opened. After the death of his father in 1974 and his mother in 2000, Jim became the managing partner of Coffey Enterprises. Jim married Elizabeth Jean ‘Betty’ Vosvick on Nov. 25, 1955 in the First Presbyterian Church in Toronto. They celebrated their 50th wedding anniversary Nov. 25, 2005 by renewing their vows in the same church. Jim has been a member of the church since 1948 and he was an ordained Deacon and Elder. In late 1959 Jim joined the Toronto Lions Club and has remained a member for nearly 59 years. 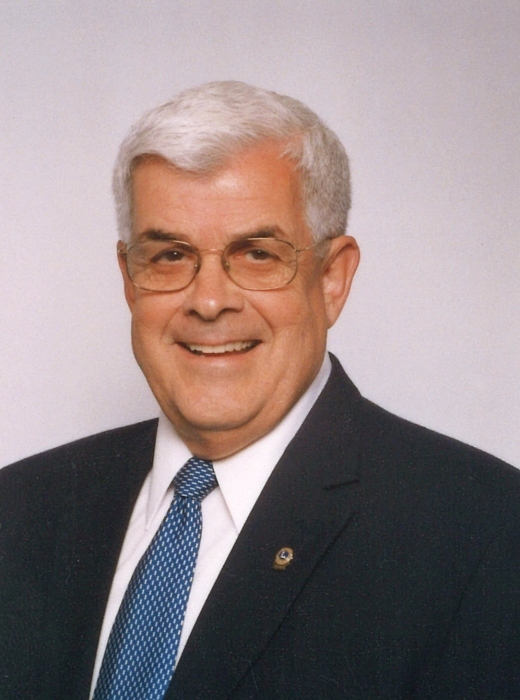 He served in most offices of Lionism at the local club, district and state level. He served as an International Director from 1980-1982 and in 1990 he was elected Third Vice President of Lions International. After serving three years as a VP he was elected President for the 1993-1994 term. During his years as an Officer from 1990-1995, Jim and his wife Betty traveled to 110 countries. In addition to his parents, Jim was preceded in death by his brother, Calvin Coffey. Jim leaves behind his wife Betty; his son, James Douglas Coffey and his fiancé, Darci Hurst of Bergholz, OH; his grandson, James T. Coffey II and his fiancé, Erica Filby of Toronto; his sister, Sara Franke of Toronto; his former daughter-in-law, Linda Coffey of Toronto; his sisters-in-law, Suzanne Coffey of West Lafayette, OH and Mary Ann Whalen of Toronto; his brother-in-law, Sonny (Karen) Vosvick of Toronto; and many nieces and nephews. Jim was an avid sports fan, his favorite teams being the Toronto Red Knights, the Ohio State Buckeyes and the Cleveland Browns. Jim attended many Super Bowls and college games including 36 consecutive Orange Bowls. Jim also served six years in the Army National Guard including six months of active duty. Jim was a devoted husband, father and grandfather. He touched many lives throughout the world and enriched the lives of many friends and family and provided them with immeasurable comfort and support. Jim always thought of others before himself and he will be deeply missed by all who knew him. Family and friends will be received Sunday, July 15 from 12-3 pm and 5-7 pm at the J.E. Foster Funeral Home in Toronto, OH. Additional viewing will be held on Monday morning from 10 am until the time of his funeral service at 11 am at the First Presbyterian Church in Toronto. Rev. Tyler Bayless will officiate. Burial will follow in Island Creek Cemetery in Toronto. There will be a Lions Club Service at the funeral home Sunday evening at 7 pm. There will also be an Elder’s Service held at the church at 10:45 Monday morning. Jim’s family would like to thank his long-time family physician, Dr. Stephen H. Mascio DO and Charity Hospice for their comfort and support. Memorial donations may be directed to: Lions Club International Foundation (LCIF) Dept. 4547 Carol Stream, IL 60122-4547 or thru their website www.lcif.org.